The UK vaping industry is booming right now and with so much product choice available to consumers on the high street and online, it’s imperative that brands make their packaging not only stand out and look attractive, but work practically on the retail shelves by providing innovative protective solutions. 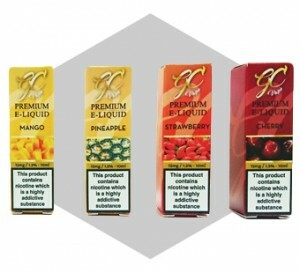 Glossop Cartons has vast experience in carton board vape packaging production and the expertise to produce a number of carton variants in a single run for each vape flavour, using our combined litho and digital capabilities. Whether you need a large run or a smaller job fulfilling, we are set up to produce and deliver without limitation. Our production capabilities are second to none and we specialise in producing high quality cartons with a strong composition, whilst ensuring a fast turnaround. Under new legislation announced in May 2017, E-liquids must be packaged in child-resistant with evident tamper-proof packaging, in line with pharmaceutical packaging. Glossop Cartons can offer full industry-recognised compliance for pharmaceutical packaging, offering reassurance that these obligations are met. With a number of exciting finishing options available including metallic, varnishes, foil and embossing, we ensure each carton looks eye catching and gets the attention it deserves by guiding you through the best cost-effective options for your vape range, from plain and shaped cartons through to custom-made designed die and laser cutting with intricate, eye-catching designs. Whatever your packaging needs, Glossop Cartons can advise on the most workable solutions for your brand and deliver innovative solutions that stand out from the crowd.